Have our customers stopped listening to us? They feel bombarded by irrelevant sales pitches and it’s getting worse. Our IT colleagues keep on inventing new types of arrow for us to fire at our poor overloaded customers. But what if they felt they were in a great conversation with us? Maybe they’d open up. Difficult in today’s multichannel environment, but it can be done. 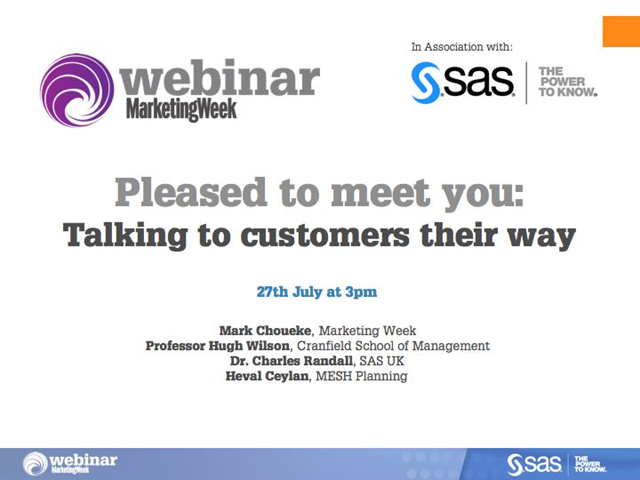 SAS presents the results of an exciting and ground breaking research project it conducted with Professor Hugh Wilson of Cranfield School of Management. The research looked at the consumer’s experience of multichannel marketing. Find out what was discovered, and critically, what the findings mean for the future of sales, marketing, and customer facing departments.